The essence of the BIM involves the fact that a design is treated as an integral part of the building life cycle. The work between the design parts and members is replaced by the adjusted process. This is achieved by changing the design technology substantially, switching from the development of a set of 2D drawings to the development of a 3D computer-aided model of a building, that consists of all the parts of the design, such as architectural, structural, mechanical, technological, construction process management and estimates. In the design stage, these goals are brought into effect by the technology of a Building continuum model, which focuses on the finally completed and fully equipped 3D building model comprising all the design parts. The base of this technology consists of the 3D graphical-information model covering the following: building a geometrical model; its physical properties (materials, etc. ); functional peculiarities of its components. One of the fundamental innovations of this technology includes component modelling. The component modelling technology allows working in parallel with all design data at the level of data components covering the entire design cycle on the scale of a users group. Engineering components are graphical models of real objects. These models characterize geometry, properties, links, and attributes of the real objects. It is assumed that a building consists of elements and parts different by their functions, properties, and manufacture technology. Each part may consist of a simple structural component or a complex structure. All elements or parts have a specific 3D shape with the properties of the elements of real structures (physical properties, class or standard). They are parametrically controlled and intellectual, i.e. each object “knows” about itself both quantitative information (length, area, volume, and etc.) and qualitative information (material, contents). All this provide unlimited possibilities not only to develop objects, to change and edit the shape of objects rapidly and effectively, but also to preserve and manage their attributive information, using the 3D building model. In the meanwhile 2D information, i.e. different drawings (plans, sections, facades, details, and nodes) and other design documentation (list of materials, specifications, reports, and estimates) are generated from the 3D model. Quantity and price of the specified components may be calculated by the measurement units required taking into account volume, area, length, or just by the parameter entered. Since these reports are linked to the model, new editions of the model update design data automatically. If necessary, external databases may be connected and used. Thus, accuracy, coordination, and synchronization of changes in the whole project documentation are ensured. BIM consists of discipline-specific solutions, working together. By applying information and model-based technology solutions to allow the automatic generation of drawings and reports, design analysis, cost estimating, schedule simulation, facilities management, and more – ultimately enabling the building team to focus on the information and their decisions, rather than the documentation tools and process. The result is a better way for building teams to work – with time saved, improved quality, and better buildings because of the informed decisions made along the way. Using BIM the entire lifecycle of the building is considered (design/build/operations). 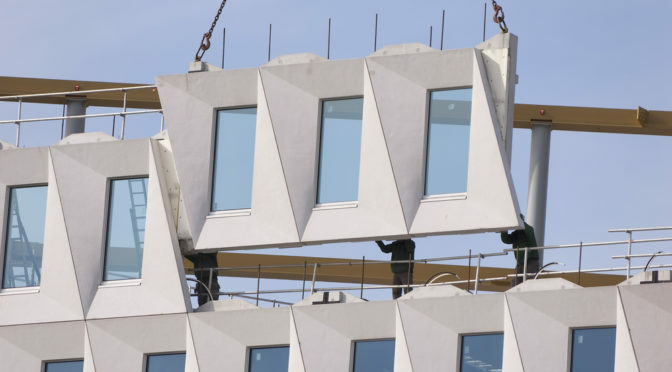 All information about the building and its lifecycle are included defining and simulating the building, its delivery, and operation using integrated tools. BIM integrates work, processes, and information for the following: multiple disciplines, multiple companies; multiple project phases. Bracing is considered as an efficient and economical method to laterally stiffen the frame structures against the wind loads. A braced bent includes the columns and girders with the primary purpose of supporting the gravity loading, and diagonal bracing members that are connected so that total set of members form a vertical cantilever truss to resist the horizontal forces. Bracing is considered efficient as the diagonals tend to work in axial stress and therefore need minimum member sizes in providing the stiffness and strength against horizontal shear.With the increase in trend of constructing tall buildings,there must be a cost effective structural form of bracing system that needs be used in tall buildings against the lateral loads.A regular shape tall building can be analyzed for wind loads acting along the minor axis of bending of column and acting along the major axis of bending of column. Similarly,when wind loads along the minor axis the building is braced in minor direction of bending and when the wind loads along the major axis the building is braced in minor direction of bending. Moreover, various options of bracing provision in different bays of the building at same level have also been identified. This type of bracing isgenerally used when the availability of the opening spaces in a bay of frame are required. Diagonal bracing is usually obstructive in nature because it blocks the location of opening which ultimately affects the esthetic of the building elevation. It also sometimes hinders the passage for use. Diagonal bracing can be either single or double diagonal . If there is no architectural limitation, diagonal bracings are considered to be the most efficient in resisting the lateral forces due to wind as these form a fully triangular vertical truss. The beams and columns are actually designed to take up the gravity loads only. The full diagonal bracing is not preferably used in areas where a passage is required. In such cases, k – bracings are used over diagonal bracing because there is a room to provide opening for doors and windows. Besides K-bracing, there is another type of bracing in which door and window openings can be allowed which is known as eccentric bracing . Such type of bracing arrangement cause the bending of the horizontal members of the web of braced bent. Generally these types of braced bents tend to resist the lateral forces due to the bending action of beams and columns. These provide less lateral stiffness hence less efficient as compared to diagonal bracingUnder the action of gravity loads, columns shorten axially due to the compressive loads. As a result the diagonals are subjected to compression and beam will undergo axial tension due to the tying action . In situations where diagonals are not connected at the end of the beam, the diagonal members will not carry any force because no restraint is provided by the beams to develop force. Therefore, such bracing will not take part in resisting the gravity loads. Steel is outlined as an alloy of iron and carbon, although alternative alloying components also are found in several steels.The foremost dramatic property of steel is that some alloys may be reinforced by quench hardening. Hot metal is speedily cooled by plunging it into a liquid. These alloys will therefore be ductile for fabrication and far stronger as a finished product. 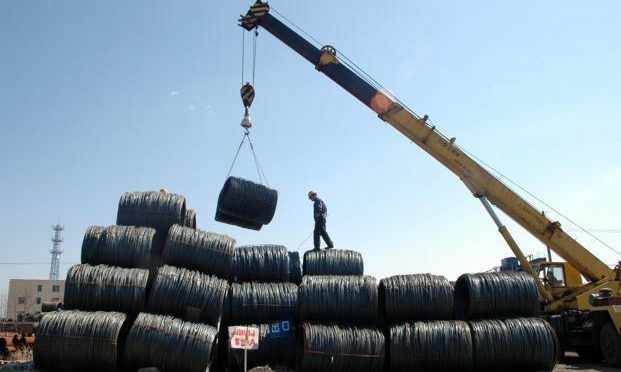 Steels are loosely sorted by carbon content into low carbon steels (< zero.35% carbon by weight, approximately), medium carbon steels (0.35%–0.5% carbon by weight, approximately), and high carbon steels (0.5%–1.5% carbon by weight, approximately). These numbers could appear to be little, however they replicate the very fact that carbon may be a little, light-weight component, whereas iron may be a abundant larger, heavier atom. once metallurgists check out the elaborated structure of steels, they’re involved concerning the presence, and notably the form, of the inorganic compound Fe3C. This compound is twenty fifth carbon by atom fraction, but only 6.7% carbon by weight. There square measure 2 principal disadvantages with victimisation steels. Among metals, steel is comparatively significant. they will conjointly deteriorate by corrosion. However, the expectation is that, if steel can work, it’ll in all probability be the smallest amount high-ticket metal alternative. Low Carbon Steels This class contains far and away the most important tunnage of steel created, because it includes the structural steels of bridges and buildings. These steels typically have little amounts of alternative alloying components. they’re not quench hardened, as plasticity within the final product is desired. Low carbon steels are generally observed as delicate steels. In some cases, these steels could also be surface treated to get the most effective of each worlds – a ductile, impact-resistant interior with a tough, abrasive-resistant surface. Common surface treatments for hardness embrace carburizing, nitriding, and cyaniding. 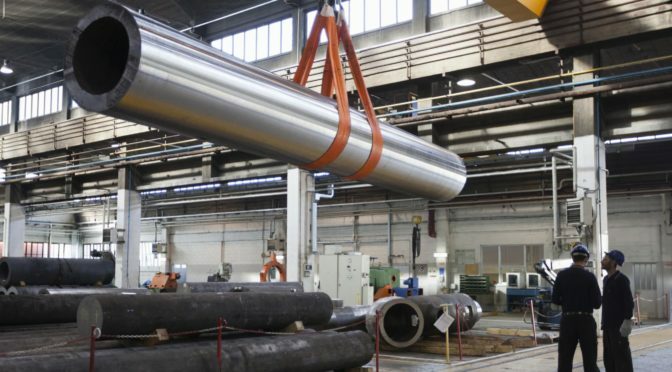 Low carbon steels might also be surface treated for corrosion resistance, victimisation processes of galvanising, electroplating, yet as simply plain painting. Medium Carbon Steels Steels during this class also are medium alloy steels. Up to concerning third-dimensional by weight can be comprised of varied proportions of metal, nickel, chromium, molybdenum, or generally alternative components. Medium alloy steels may be quench hardened, and therefore the supplemental alloying components square measure primarily to boost hardenability. Hardenability can be loosely represented because the simple getting hardness. To harden steel, its temperature should be modified speedily to avoid the formation of softer equilibrium phases, and to provide the required arduous, robust section known as primary solid solution. Upon ending, the surface cools 1st, whereas the inside cools additional slowly. These temperature gradients produce stresses that, within the worst case, will crack the half. Also, the inside might not cool quickly enough to harden. Steels of high hardenability square measure advantageous in 2 aspects:  For a given quench medium, larger components may be totally hardened.  For a given half, a milder, less speedy quench may be accustomed minimize cracking. The atoms of a metal square measure positioned in symmetrical geometrical arrays known as crystal lattices. a selected array of Associate in Nursing alloy is named a section. High Carbon Steels These also are the high alloy steels, with some 5%–10% by weight consisting of alloying components apart from carbon. tho’high carbon steels square measure employed in the littlest amounts, these square measure specialty steels, usually observed as tool steels. they’re the steels used for hammers, pick-axes, and cutting tools like knives and chisels. they’re the steels used at the best temperatures. The tool steels square measure usually heat treated. The Quench Hardening method There square measure 3 stages to the quench hardening of steels: answer heat treat, quench, and heat (temper). The Quench Hardening method – answer Heat Treat The steel is command at a warm temperature to dissolve the alloying components into a standardized, primary solid solution beginning section. The time needed depends totally on the dimensions of the half. The Quench Hardening method – Quench The hardening (strengthening) happens here. speedy quenches promote hardening however risk cracking. Slower quenches forestall cracking, however might not sufficiently harden. the subsequent media square measure ordered from severe quench (rapid) to delicate quench (slow) The Quench Hardening method – heat (Temper) instantly once ending, steel is simply too brittle to be serviceable. Tempering is holding the half at an intermediate temperature between the initial answer temperature and therefore the quench temperature. The aim of tempering is to revive impact strength to the hardened half. India the world’s fifteenth-largest importer of steel. In 2017,we have imported 9 million metric tonnes of steel, a 9.7% decrease at 8 million metric tons in 2016. India’s steel imports showed 6% of all steel globally in 2016. Based on the information the data of India’s 2017 steel imports was almost a quarter of of the world’s largest steel importers, the US..In terms of cost steel 7 % of of the overall production is imported in 2017.India imports steel from almost 80 countries and territories. 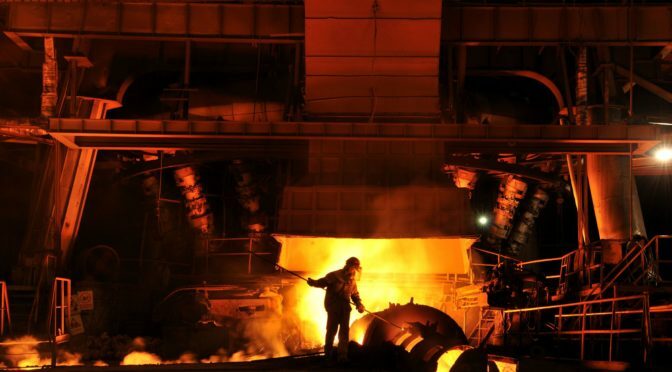 Five major countries represent the highest import sources for India’s imports of steel, with 250 thousand metric tons which accounts for 80% of India’s steel imports in 2017 .Since 2005 india has alternated between being an internet steel businessperson and an internet steel bourgeois. Imports and exports have displayed a roughly inverse relationship, as imports declined sharply with export growth. Since the most up-to-date low purpose steel , India’s imports have increased to thirty eight %.India announced a steel trade surplus of 181.7 thousand metric tons in 2016. In 2017, however, a jump in exports and a decrease in imports resulted in a very vital increase within the surplus to seve 7.1 million metric tons. India’s crude production has grown to 59.6 p.c between 2009 and 2017. Production in 2016 was up to half dozen to a 101.4 million metric tons from 95.6 million metric tons in 2017. Apparent consumption (of steel demand) has half-tracked comparatively closely with production over the amount however was slightly outpaced by production within the majority of years. In 2017, apparent consumption was a small amount but production. Import penetration shriveled 0.9 proportion points from 10.3 % in 2016 to 9.4 %in 2017 because the decline in apparent consumption was offset by the decrease in imports.Prime Producers Before economic reforms in 1991,production in India was focused among state -owned firms. currently,non-public firms dominate crude production in India . The highest half dozen producers accounted for 55.5 million metric tons, or 56.7 %of total 2017 production.The top five supply countries for India’s steel imports depicted concerning 79 % of the overall steel import volume in 2017 at 7.0 million metric tons (mmt).Asian country accounted for the biggest share of India’s imports by supply country at concerning 30%(2.6 mmt), followed by China at concerning 28 %(2.5 mmt), Japan at concerning 15 %(1.3 mmt), Indonesia at 3.1%(0.3 mmt), and Taiwan at 30 %(0.3 mmt). The U S Stratified twelfth as a supply for India’s steel imports.Indian import concerning a 110.0 thousand metric tons from the u. s.in 2017 —or so associate 8 5 increase from 102.0 thousand metric tons in 2016. Trends in Imports from prime Sources the amount of India’s steel imports shriveled in 5 of India’s major ten steel import sources between 2016 and 2017. India’s imports from Russia showed the best decrease in volume, down 45.1% by volume from 2016, followed by China (down 25.5%),Federal Republic of Germany(down 17.4%),Indonesia (down 16.5%), and Japan (down 8.9%). India’s imports from Vietnam jumped 677.5 percent. India’s imports from Taiwan, Ukraine, France and Asian country showed will increase in volume between 2016 and 2017, up 32.5 percent, 29.1 percent, and 12.7, and 8.4 percent severally.The general price of India’s imports shriveled in four of its prime 10 sources. The decreases in steel price between twenty 16 and 2017 enclosed India’s imports from Russia (down 20.6%),Federal Republic of Germany(down 16.6%), France (5.1%), and China (1.5%). Imports from Vietnam surged 384.1 whereas Ukrayina (68.1%), Taiwan (42.4%), Asian country(32.5%),Indonesia (29.1), and Japan (12.9) all hyperbolic in price in 2017. How are the steel Beam –Column connections designed? The use of multistorey composite structures (steel columns, steel beams, and reinforced concrete slabs) became a necessity. The multi storey composite structures are used for different types of buildings such as office buildings, bank buildings, industrial buildings, public buildings, high-rise parking buildings, etc. These kind of buildings can be seen around the world, in the highly developed countries depicting their financial and technical power. 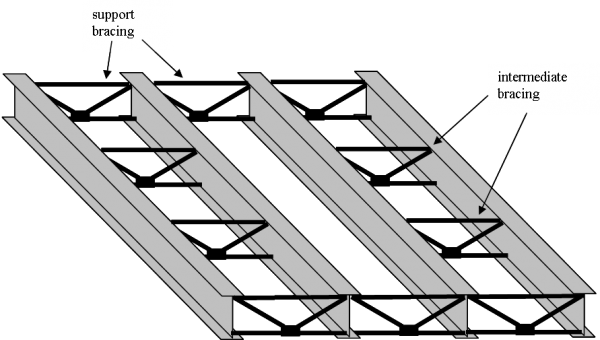 The safety and function expressed through control of the mass, stiffness, strength, and ductility at the structural design of the multi storey composite structures, and mostly of the connections of the elements exposed under cyclic-horizontal loading (such as earthquake, wind loading) in combination with other loading is of highest priority for this kind of structures. The behavior of the beam-column connections in the multi storey frame structures (MSFS) is viewed as a whole and it’s in direct correlation and dependence with the behavior of their main constructive fundamental elements (steel deisgning courses in kerala beams, columns and the elements for their connection) . In other words, the way the beams, the columns and their elements of connection behave, that way the MSFS behaves. The behavior of the beam-column connection in the MSFS again is dependent on the constructive solution. However, dominant in this paper is the research of new or modified constructive solutions of the connections, and all with the purpose of improving their loading capacity in conditions of real external loading. Some constructive solutions can be controlled by the dissipation of energy, meaning,they can be controlled by the stress and deformation distribution in the sections of the elements of the MSFS i.e. the constructive solution of the connection directly influences the appearance of the plastic hinges in some of the sections of the elements, when their loading capacity is exhausted. In the numerical modeling of the beam-column connection the demands of the new codes ,, are incorporated, which is the well-known concept of the seismic resistant structure that proposes development of plastic hinges in the beams, and columns. Consequently, the size of the static influence that dictates the order of the plastic hinge appearance should be taken under consideration i.e., column bending strength should be larger then beam bending strength. With the alternative of the collapse mechanism (the order of the element’s plastification) and generally the mechanism of energy dissipation, two different approaches exist: The first approach is based on the contribution of the panel–zone in the energy dissipation with the purpose of its reduction and also accepting a part of the plastic deformations, without excluding the contribution of the columns and the beams. The second approach does not include the panel zone in the energy dissipation. As a result, the end parts of the beam must accept the plastic deformations. Thus the beam–column connection can be specified in detail. During design of connections it is important to control the weight, stiffness, strength and the ductility of the material of the elements. This is due the fact that their behavior depends on the mentioned parameters of the elements in the connections . The deformation (rotation) capability is inversely proportional to the capacity of carrying of the beam i.e. the semi rigid connections have bigger plastic deformations and possibility for bigger rotation during the use of their total capacity to carry, but they have smaller capacity to carry comparing to the ones with rigid connection. In Developing countries, the method of application of pre-cast system is a bit completely different and simple, all concrete structural part (such as slabs, beams, columns, wall panels and footings) are made in vast fashionable factories. In these factories there are heaps of automatic central concrete mixers, completely different material containers, cement silos, water tanks. For manufacturing formed units of various varieties and kind works, there are many production areas, several steel beds (steel formwork) with hydraulic jacks and overhead electrical cranes. The concrete mixes that area unit made for formed units, area unit of various varieties and strengths. The strategies of hardening area unit heaps, like electrical water pipes, new steam hardening systems, additionally hot air hardening rooms. There are many varieties of slabs made .Hollow core slabs with traditional ferroconcrete, for tiny and medium spans, hollow core slabs with pre-stressed concrete for giant spans up to twenty four meters. The tactic of production of such slabs is by exploitation extruding machine. There are different varieties of slabs, like T and double T slabs, giant panel slabs, and post tension block column affiliation. There are many varieties of formed beams, born ferroconcrete linear and sinuate formed beams, with little and medium spans, beams with pre-stressed concrete for giant spans. There are differing types of a hundred and fifty five formed columns with completely different sections and forms, with and while not corbels. Additionally there are differing types of formed footings, like single, double, strip, and raft foundations. The transportation of the formed units used area unit trailers, helicopters and large trucks. The erection method within the website relies on exploitation terribly fashionable technology strategies, like helicopters, vast tower cranes and Lift-slab system (floor by floor rebellion), automatic cranes, the erection may be achieved for 2 or 3 floors along. The buildings that are made in developed countries area unit of all kinds, low-rise, medium, and high-rise buildings up to thirty floors. In developing countries, per the person’s low financial gain, moderate climate, straightforward below structure and developing technology (technology transfer), the tactic that is used is incredibly straightforward and ancient. All formed ferroconcrete structural part (such as slabs, beams, columns, wall panels and footings) area unit made in little factories. In these factories there are little concrete mixers (solely one or 2 central mixers), material containers, cement silos, water tanks, that ends up in cut back the price of construction. For manufacturing formed units of various varieties and forms, there are just one or 2 production areas, heaps of steel beds with mechanical or little hydraulic jacks, one or 2 overhead cranes. The concrete mixes that area unit made for formed units, area unit of completely different varieties and strengths. The strategies of hardening area unit ancient, like wet Wellington boot, or water hardening. There are some varieties of slabs made: Hollow core slabs with traditional ferroconcrete, for tiny spans, hollow core slabs with pre-stressed concrete for medium slabs up to seven meters solely. The methodology of production of such slabs is by exploitation extruding machine. There are different varieties of slabs, like T and double T slabs. There are one or 2 varieties of formed beams made. Ferroconcrete linear formed beams, with little and medium spans up to 20metrs. There are differing types of formed columns with completely different sections and forms, with and while not corbels. Additionally there are some varieties of formed footings, like single, double, and strip foundations. The transportation of the formed units used area unit solely trailer that’s cheap. The erection method within the website relies on exploitation little technology strategies, like little cranes or straightforward cables, and also the erection is for one floor solely (step by step). The buildings that area unit made in developing countries area unit of low-rise buildings (five floors maximum) that’s not costly. because the individuals in developing countries (such as in Arab countries); area unit terribly poor (low income) , the climate is traditional in winter , and also the price of hands and instrumentation area unit low , it’s helpful to scale back the price of buildings by exploitation the Pre-cast construction because of : Short time of construction, Low cost, and increasing the building sturdiness and utility. What is meant by reinforcing steel? In reinforced concrete structure, steel which is equally strong in compression and tension, is used to combine with concrete to improve the resistance of concrete to tensile force!, The steel used to provide reinforcement in concrete structures is termed reinforcing steel. 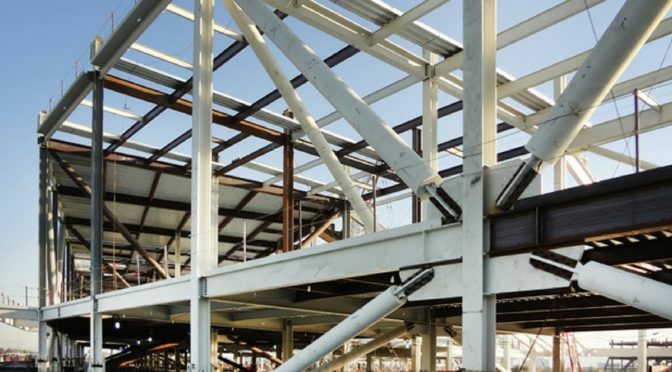 In earthquake resistance reinforced concrete structures, reinforcing steel plays an extremely important role which is significantly more demanding that its basic function. This is due to the philosophy of capacity design of reinforced concrete structures to utilize both strength and energy dissipation characteristics of the system • The energy dissipation characteristics are utilized to absorb and dissipate the dynamic seismic loads to avoid brittle failures. This energy dissipation mechanism relies on the ductility of the structure in the post-elastic range. 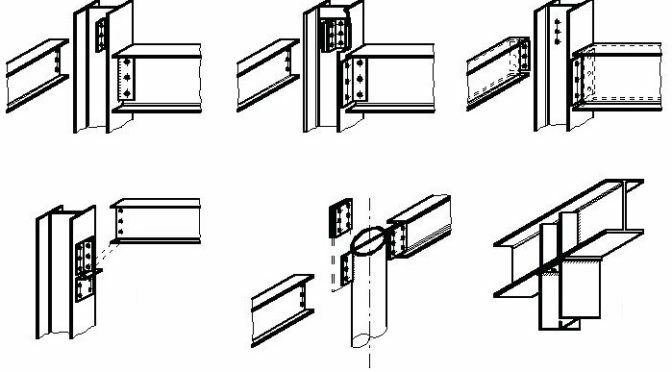 In the strong column-weak beam design concept, the ductility of the structure is ensured by the development of plastic hinges in beams adjacent to column-beam joints in preference to hinges forming in the columns. The absorption and dissipation of energy by post-elastic deformation in plastic hinges depends almost entirely on the ductility of the reinforcing steel • Steels used for reinforcement in this structure should be capable of accommodating significant amounts of strain without failure. Therefore, the ductility of reinforcing steel becomes an important requirement in the design of earthquake resistant reinforced concrete. The plastic hinge behavior of reinforced concrete members is also very dependent on the stress-strain characteristic of the reinforcing steel • During an earthquake, strains in the steel of plastic hinge regions may increase beyond the Luder strain, consequently strain-hardening occurs. This strain increase may lead to large strength increases, particularly if the strain hardening rate of the steel is high and if the steel has a short Luder strain which results in strain hardening occurring soon after yielding. Ideally, the Luder strain should be as large as possible so that the plastic strain is accommodated with a minimum of strain hardening. As a result of this flexural over strength, during subsequent earthquakes, plastic hinges may be formed in regions which have not been designed as such. Thus, relocation of the plastic hinge within the structure could give rise to an undesirable failure mode. In the design of seismic resisting concrete structures, an over strength factor which is greater than unity is included in the calculation of the steel stress at the beam plastic hinges to take into account the possibly large increase in flexural strength. Strain ageing of reinforcing steel also has a significant effect on the properties of seismic reinforced concrete structures • Strain ageing of the longitudinal reinforcing steel at plastic hinges subsequent to the first formidable seismic loading can increase the flexural strength at the plastic hinges as a result of the increase in yield strength of the steel during the ageing process. The flexural over strength brings the same effect as when strain hardening of steel occurs, i.e. causing the plastic hinges to form at alternative and undesirable regions in the structure during subsequent earthquakes. 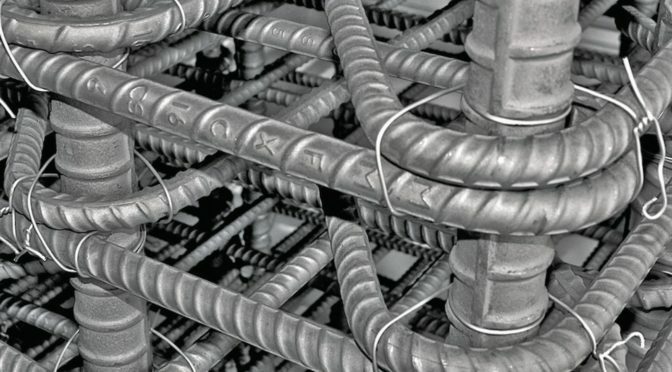 Cold bent reinforcing bars in the form of standard bends, returns or hooks contained in most regions in reinforced concrete structure will strain age during service at ambient temperature • As a result of strain age embrittlement, these strain aged regions will be susceptible to brittle failure, which may cause catastrophic fracture of the structure. It is therefore, very important to understand the effect of strain ageing on the mechanical properties of reinforcing steel used in earthquake resistant reinforced concrete structures. Unfortunately, information regarding strain hardening and strain ageing of reinforcing steels are not specified in appropriate standards, nor is the data on Luder strain. What are the different manufacturing processes in the production of steel? 1. Blast furnace/basic oxygen furnace (BF/BOF) :Iron ore is converted into liquid form of Iron by BF but Iron produced by BF has high carbon content and other impurities, this iron is called pig iron. Because of its high carbon content, Pig iron has limited end user applications. To make steel products out of pig iron The Basic oxygen furnace is used for producing steel from the refined iron and the carbon contents and other impurities are removed through slag separation. At present around 67% of the world steel is produced through BF/BOF route. This route is very good for volume production.Iron ore and coal/coke are used in BF as main inputs. It is also called oxygen furnace because oxygen is the only fuel used in the process. But the process requires high capital cost and substantial investments on infrastructure. Producers that use blast furnace technology are SAIL, RINL, TSL and JSWL. 2. Electric Arc Furnace: Steel scrap orPig iron or Sponge iron is used as the raw material in this process.Basic purpose of the EAF is re-melting sponge iron, steel scrap, and pig iron. At present around 31% of world steel is produced by this process. It uses electricity as much as 400-500 kWh/ton. EAF is an environment friendly process and has flexibility to produce variety of value added grades of steel. ISPAT, ESSAR, and the Jindal group are examples of producers, who use this technology. 3. COREX or Cipcor Process COREX is an advance process of producing steel. The process is used by a few only. Non-coking coal can directly be used in smelting work and lumpore and pellets are used as inputs in this process. With These two advantages steel producers can eliminated coking plants and sinter plants. Coking plant converts non-coking coal into more efficient fuel and sinter plant purify lump ore or pellets for further processing. Basic inputs to COREX are iron-ore and coal. COREX technology is used by Jindal Iron & Steel Company to produce finished steel. 4. Induction Arc Furnace (IAF) IAF isone of the most advance processes of steel making. IAF use selectricity as its main fuel. IAF is the most environment friendly steel making process and one of the most efficient ways of producing steel designing course in kochi. But IAF requires clean products as its inputs as it lacks refining capacity. A lot small steel companies use IAF technology.The weight of the product significantly pushes up transport and movement costs. Therefore large steel plants are the norm for cost efficient production and for specialized steel and alloys efficient production by smaller plants is possible. What are the different types of Bracing? Bracing system is one such structural system that forms associate integral a part of the frame. Such a structure has to be analyzed before effective arrangement of bracing. 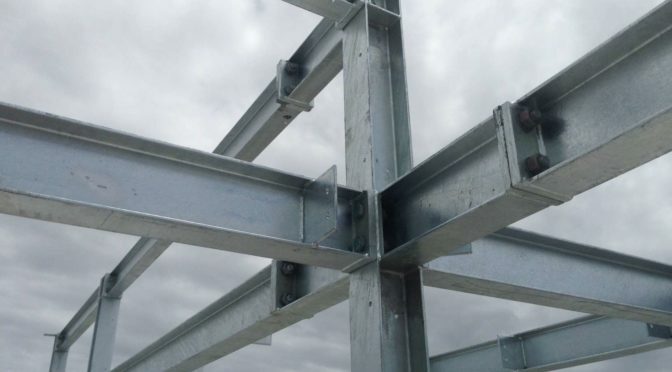 ETABS computer code is employed to get the planning of frames and bracing systems with the smallest amount weight and applicable steel section choice for beams, columns and bracing members from the quality set of steel sections. A 3 dimensional structure is enamored four horizontal bays of dimension four meters, and twenty stories is enamored structure height of 3m. The beams and columns are designed to resist dead and loading solely. Wind load and Earthquake masses are taken by bracing. The bracings are provided solely on the peripheral columns. Most of the four bracings are employed in a structure for economic functions. Bracing may be a extremely economical and economical methodology to laterally stiffen the frame structures against wind masses. A braced bent consists of usual columns and girders whose primary purpose is to support the gravity loading, and diagonal bracing members that are connected so that all the members form a vertical cantilever truss to resist the horizontal forces. Bracing is economical as a result of the diagonals add axial stress and thus necessitate minimum member sizes in providing the stiffness and strength against horizontal shear. There are 2 varieties of bracing systems 1) homo centric Bracing System and 2) Eccentric Bracing System. The steel braces are typically placed in vertically aligned spans. This method permits to getting an excellent increase of stiffness with a marginal intercalary weight. 1) homo -centric bracings increase the lateral stiffness of the frame therefore will increase the natural frequency and conjointly typically decreases the lateral structure drift. However, increase within the stiffness could attract a bigger inertia force because of earthquake. Further, whereas the bracings decrease the bending moments and shear forces in columns and that they increase the axial compression within the columns to that they’re connected. 2) Eccentric Bracings cut back the lateral stiffness of the system and improve the energy dissipation capability. The lateral stiffness of the system depends upon the flexural stiffness property of the beams and columns, therefore reducing the lateral stiffness of the frame. The vertical part of the bracing forces because of earthquake causes lateral focused load on the beams at the purpose of association of the eccentric bracing, as a result of lateral loading on a building is reversible, braces are going to be subjected successively to each tension and compression, consequently, they’re typically designed for the additional rigorous case of compression. For this reason, bracing systems with shorter braces, for instance K bracing, could also be most popular to the total diagonal varieties. As associate exception to planning braces for compression, the braces within the double diagonal is meant to hold in tension the total shear in panel. a big advantage of the absolutely triangulated bracing varieties is that the girders moments and shears are freelance of the lateral loading on the structural designing course in kerala. Consequently, the ground framing, that during this case, is meant for gravity loading solely, will be repetitive throughout the peak of the structure with obvious economy within the style and construction. The role of internet members in resisting shear will be incontestable by following the trail of the horizontal shear down the braced bent. The conception of mistreatment steel bracing is one in every of the advantageous ideas which might be accustomed to strengthen or retrofit the present structures. The lateral structure displacements of the building are greatly reduced by the utilization of single diagonal bracings organized as diamond form in third and fourth bay compared to homo- centric (X) bracing and eccentric (V) bracing system.